Be rewarded, from day 1. 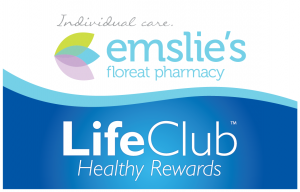 ‘LifeClub’ A loyalty club that really is… rewarding! Join our LifeClub (pharmacy loyalty club) and you’ll be rewarded immediately, as well as for each purchase you make with us (just not prescriptions or things that are already on special). There’s no catch here – we just want to reward our regular customers for their loyalty. Let’s face it, we need your business to be in business and so we’re willing to give something back to make shopping with Emslie’s even more rewarding. There’s nothing complicated in our program either. In fact its really simple – just by joining and even before your first purchase as a LifeClub member, we’ll reward you with a 20% OFF voucher to spend in-store. From then on, we’ll give you a $5 reward for every 100 points you earn – and $1 spent earns you 1 point. There’s no cost to join but lots to gain, so to join just click here and fill in your details!